April O'Neil. 2011. Watercolor, gouache, and acrylic on paper, 9 × 12″. The New York Comic Con is almost here! I will be in Artist Alley all weekend and I've listed all my pertinent information below, including commissions policy and signing times. 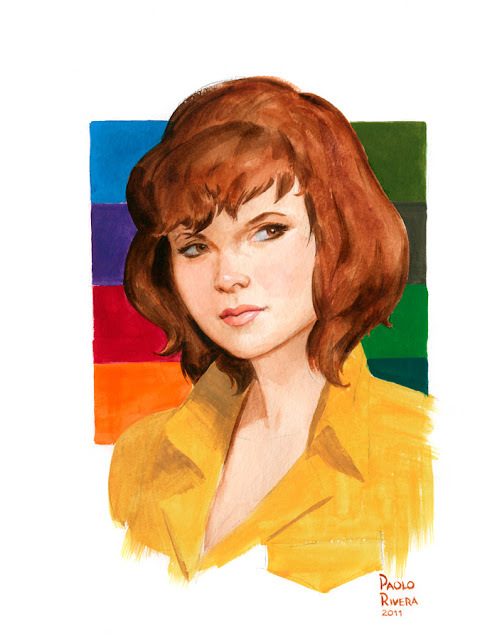 There will be a charity auction for St. Jude Children's Research Hospital on Friday and the lovely April O'Neil, pictured above, will be my contribution. My original art is available at Splashpage Comic Art, booth 1175. I may or may not be in costume on Saturday. I will be accepting a limited number of 9 × 12″ watercolor portraits at the show. The cost is $100 and I'll start a new list at the beginning of each day (which typically fills up within the first hour). I reserve the right to pick names at random from the list or to choose the commissions which interest me. I can't paint on blank covers, unless it's over line art. My apologies! Black and white head sketches are $40. If there's a print you're interested in, please contact me via the blog. Sorry, where are those times? Thank you! Actually not sure just yet. I'll post as soon as I know. wow! this one is gorgeous. I wish I could be there to see it in person. Have a great con! Are there any prints of the Amazing Spider-Man #646 cover available? Absolutely, Cary. Hopefully, I'll have enough.